Sunday is Funday as kids get into the footy for free! Plus meet Easter Bunny & Easter chocolate giveaways! 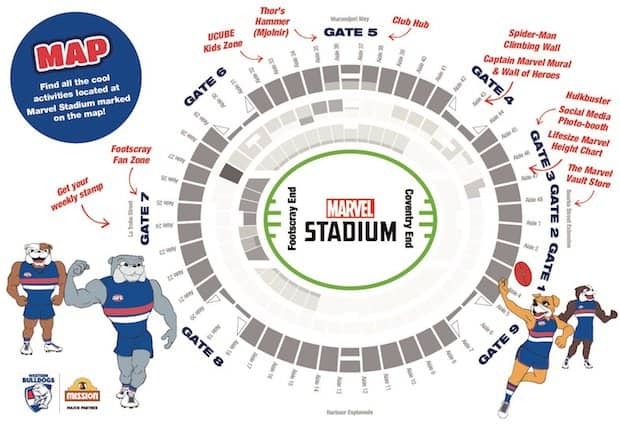 In a bumper day of family fun there will be the Footscray End Fan Zone located at Gate 7, Maccas Kick to Kick on the ground after the game and a great range of Marvel entertainment around the stadium. There’s even more reason to get to the football on Sunday afternoon. BUY TICKETS: To purchase tickets, including $0 junior general admission tickets for the Western Bulldogs’ Sunday game at Marvel Stadium, click here. Come in join in the fun at the Footscray End Fan Zone located at Gate 7. It will be a hub of fun, entertainment and activities at the Easter Sunday Funday game! Caesar will be happy for a photo too! See how you shape up against our team by testing how high you can jump and compare your foot size. Collect your Kids Club booklet to get stamped at Bulldogs home games and collect giveaways. For more information on The Pack Kids Club click here. Speak to the team about supporting the club and becoming a Western Bulldogs member. Located outside Gate 5. Grab a drink and bite to eat before you head into the game and get to the Food Trucks and The Garden Gate Bar located outside Gate 5. There will be loads of entertainment for the whole family around the stadium including the Captain Marvel: Wall of Heroes interactive mural, Captain Marvel photo experience, Spiderman climbing wall, Lifesize Marvel Height Chart and plenty more. Check out the map for locations. UCUBE is a free, fun and new way for your kids to experience the footy. The kids zone features a huge variety of sensory play equipment, including slides, ball pits, obstacles, jumping mats, tackle bags, footballs and more. You’ll have the chance to meet AFL players before the game and there will be a special visit from Easter Bunny. Located at Gate 5 on the internal concourse, near aisle 33. UCUBE is open to children aged 5-14 years from when gates open until end of half time. Until the end of April, Marvel Stadium is offering children under the age of 16 a free piece of fruit at the Footy on Saturdays. Train Walk from Southern Cross Station via the pedestrian bridge to Marvel Stadium. It's around a four-minute walk. If you’re coming from outside Melbourne, V/Line services will take you to Southern Cross Station. Trams run to Marvel Stadium from LaTrobe Street and Harbour Esplanade. They also stop in the CBD on Spencer Street, Bourke Street and Collins Street and all are a short walk to the venue. Visit Public Transport Victoria for more information. Due to major construction across the metropolitan and regional train network in 2019, fans are encouraged to allow at least 30 minutes extra travel time to get to Marvel Stadium and the MCG on impacted lines. For all timetables and live updates visit the V/Line or Public Transport Victoria websites. We encourage members general admission access to consider upgrading to a reserved seat via Ticketmaster to guarantee entry. Members only pay the discount member rate to upgrade to a reserved seat by entering their 12-digit barcode. Click here to upgrade. General Admission entry is always subject to capacity and may not be guaranteed should the stadium advise capacity has been reached. Beat the queues and buy your tickets in advance online here via Ticketmaster. The Studio Restaurant, Stack Burger, Chicken Republic, Garden Gate Bar, Smoke and Smoulder and various Café outlets for a hot drink and a jam donut! Our friendly membership staff will be located in the Membership Club Hub located outside Gate 5 or click here for more information. Where can I buy supporter merchandise? Purchase your Bulldogs merchandise from the Bulldogs merchandise outlet located inside gate 5 and 7 at Marvel Stadium. Baby changing facilities are available in all disabled toilets. Parent Rooms are located on level 1 Aisle 3 and include baby change table, child-friendly play panel, a microwave and television as well as both private and public feeding areas. Cloaking facilities are available at the Customer Service Desk located inside Gate 4 (Level 1, Aisle 43). ATMs are located on level 1 at gate 1, gate 2 (internal and external) and gate 7 (external) plus gate 9 on level 2. Follow @westernbulldogs on Twitter for the latest breaking match day news and quarter-by-quarter scores. Follow @westernbulldogs on Instagram for all the behind the scenes photos from match day. Make sure you tag us in photos to be featured in our social post review! Like the Western Bulldogs Facebook page for the latest breaking news, behind the scenes video and much more from the Kennel. Check if the roof will be open by following @RalftheRoof on Twitter!